On Monday President Obama signed an executive order enabling fourteen states to set strict limits on greenhouse gas emissions and fuel efficiency for cars and trucks. 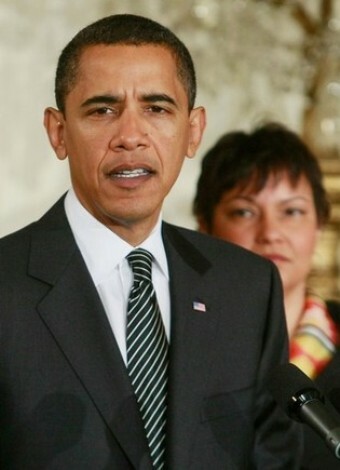 Pictured above behind Obama is Environmental Protection Agency Administrator Lisa Jackson, who is actually really psyched about this development. 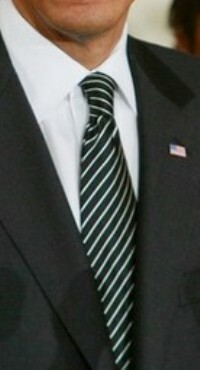 The symbolism in Monday’s tie choice is unequivocally in favor of protecting the environment. Dark green betrays Obama’s love of mother earth, or Gaea if you will, while the white stripes, which resemble the lanes on a United States interstate highway, represent human-kind’s expansion at the expense of nature.